Emergency dentists are a must everywhere, as dental mishaps can happen suddenly, regardless of the time of the day. That is why emergency dentists are so important, as they operate 24 hours a day and 7 days a week. It is important to visit the dentist as soon as something goes wrong, as you should never take dental issues lightly. Even the tiniest of problems could indicate something much more serious, as dental issues are sometimes the first symptoms of other, bigger physiological problems. Emergency dentists are also a blessing to those who cannot visit a normal dentist during the weekdays due to full-time jobs clogging up their schedule, and since normal dentists don’t operate during the weekend, emergency dentists are the best place to go to. Evansville happens to be the commercial, medical, and cultural hub of Southwestern Indiana and the Illinois-Indiana-Kentucky tri-state area. 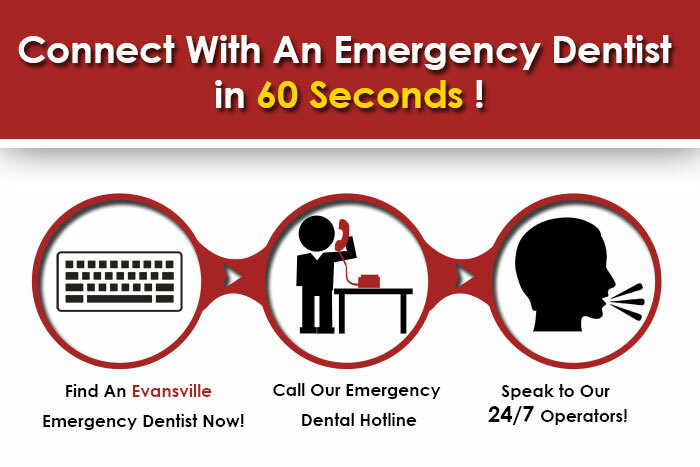 Being the third largest city in the state ofIndiana and the largest city in Southern Indiana, Evansville needs more than one dentist to take care of the city’s emergency needs. It is no surprise that emergency dentists are highly prized in a city as populated as such. Hence, the residents of Evansville need some emergency dentists to turn to. Find Indiana 24 hour dentists today. The following is a list of emergency dentists and dental clinics for the residents of this city. Aspen Dental provides services, such as Oral Cancer Screening, Digital Radiography, Cosmetic Dentistry, Dental Implants, Root Canal Therapy, and Oral Surgeries. They also have a money back guarantee for dentures if their patients are not happy with them. Located at 5020 West Lloyd Expy, Suite 2005020, they provide comprehensive dental services at a convenient location. They can be contacted at 812-297-5418. Dr. Max Lingo has provided his valuable service to the residents of Indiana and Kentucky for over 40 years at his centrally located dental practice in 3323 Mariner Drive, Evansville. Patients trust Dr. Lingo, as he providesa comfortable and high quality dental care with a focus on full mouth rehabilitation, oral surgery, cosmetic treatment, and dental implants.Call today at 812-809-4999if you have an emergency. Their wide range of dental services include restorative care, cosmetic treatments or straightening teeth, etc. They accept CareCredit schemes, which can be used in combination of medical insurance with which patients can receive both general and cosmetic dental services in an affordable cost. They are located at1220 Washington Ave.Call them today for more information, to book an appointment, or during emergencies at 812-473-1400. Reliant Family Dental has the experienced Dr. Chris Meunier, who provides services, such as Bonding, Cosmetic Contouring, Crowns and Bridges, Implants, Grafts, Root Canal Therapy, Extractions, Dentures, Veneers, Whitening, etc. The location of this clinic is at 4873 Davis Lant Drive Suite G,and you can call at 812-864-4063to book an appointment or for more information.